Rural Minnesota is experiencing rapid change. As local economies shift from agriculture to services and industry, small communities are struggling to revive and reinvent their economies. Residents are aging, and young people are leaving for cities. The resulting rural decline and decay often dominate media and public opinion. However, exciting changes are occurring in rural Minnesota that counters this storyline; many communities are creating their own, positive rural narratives. The general population decline is offset by two factors: the brain-gain phenomenon of 30-40 year olds returning to rural communities, and by the influx of immigrant populations. From 2000 to 2010, the Latino population in Stevens County, MN rose by 274%. This project documents a newly emerging Latino community by putting faces and stories to statistics in the town of Morris, Minnesota. While the community has made great advances in reaching out to Latino immigrants, barriers still exist to constructive integration in the forms of language, culture, and employment opportunities. This project helps bridge these barriers by creating art that tells the stories of people establishing their roots in the Minnesota prairie. While the delineation of changing communities has become commonplace, each individual community has its own unique story to tell. About 160 miles northwest of the Twin Cities in what is called the Prairie Pothole Lakes region, Morris stands out as an exemplary community because of its history and its current drive to meet the needs arising from changing demographics. Originally inhabited by Lakota, Dakota, and Anishinaabe, the region is home to some of the most fertile soil in the world, left behind by the Glacial Lake Agassiz. The area was farmed by Anishinaabe tribes living in the area, and upon European settlement in the late 1800s it was farmed more industrially. European settlement also brought Christianity to the region, and in 1887 the Sisters of Mercy Order of the Catholic Church established an American Indian Boarding School, which forcefully assimilated Native American youth before its closure in 1909. The facility was converted to an agricultural boarding school in 1910, and in 1960 became the site of the University of Minnesota, Morris. With 1,800 students, the college community now makes up a large portion of Morris’ population, 5,277, and has played an important role in facilitating communication between Anglos and recently arrived Latinos. The story of Latino immigration began with the establishment of the Apostolic Christian Church community, a conservative protestant church established in Morris in the early 1900s. The church collectively became an economic force in the region, buying land and livestock operations. In 1939, Paul and Anna Fehr moved to the Morris area as a part of this church community and established a small diversified farm. In the mid-1970s, the family-owned business was incorporated under the name Riverview. As more family and community members sought participation in the farm, Riverview expanded heavily in 1995, establishing an 800-head dairy operation. However, they soon faced serious labor shortages. Dairy operations require consistent, numerous, and hard-working employees. The company began seeking labor outside the Morris area, and in 2000, following the practice of many meat-packing facilities and processing plants south of Morris, the dairy began to recruit Latinos. 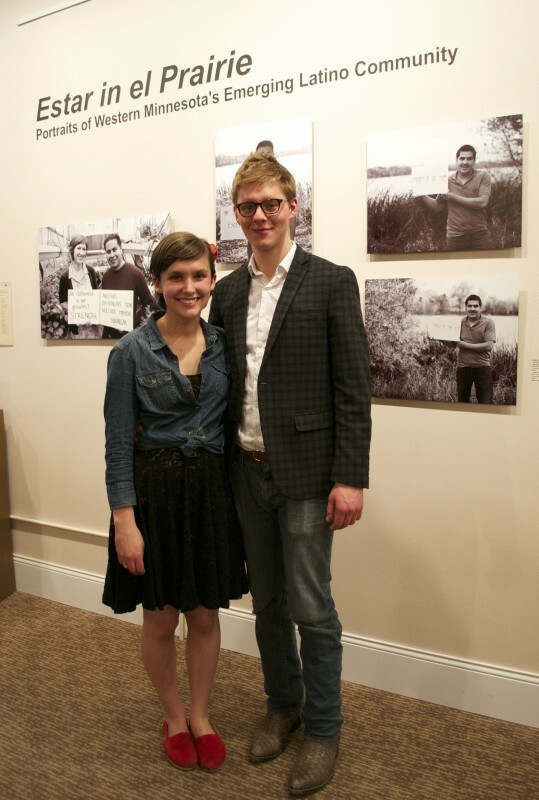 “Estar in el Prairie” Gallery Reception and Exhibit, K.K. Berge Gallery, Granite Falls. Since 2000, the number of Latinos in the Morris area has grown by over 274%. Riverview originally advertised employment opportunities to nearby communities such as Willmar, Minnesota where a growing Latino community had already been established by food processing industries like Jennie-O and RELCO. Though hardworking, this group did not have the specialized training that the dairy operation needed. In response, Riverview began to explore alternative recruiting. Collaborating with a federal visa program established under NAFTA allowed Riverview to recruit labor directly from Mexico. This provided skilled, yet cheap labor–key factors for expansion. Mexican recruitment occurs primarily in the state of Michoacán, located in Southwest Mexico. Riverview employs the majority of its employees under the one to three year renewable TN (NAFTA Treaty) visa program. The company now employs some 600 individuals, most of whom are college educated, and estimates that in 2010 nearly 100% of the Morris area Latino population was directly employed by Riverview alone. Employees typically work 12 hour shifts, 6 days a week, and live on-site about 5 miles South of Morris in apartments provided by Riverview. While the dairy provides inexpensive accommodation, its location and the nature of the work often leads to isolation of the Latino workers from the rest of the community, making consistent communication between Latinos and Anglos difficult. With this new workforce, Riverview has expanded to own and operate eight dairies and several other operations in multiple states. In addition, other companies in Morris such as Superior Industries, Westmor, and Hancock Concrete have begun to recruit Latino employees. Part of the successes of these industries is related to the hard work of these highly skilled individuals. Many of the Latino employees have become interested in settling permanently in the Morris community, as indicated by a University of Minnesota, Morris study conducted in 2011. Many Latinos notice and appreciate the small community, safe neighborhoods, and good schools that Morris and the surrounding towns provide. They see Western Minnesota as an opportune place to raise a family. Latino immigrants bring with them a new language and diverse new cultures that will expand and shape the broader community. However, they also face serious challenges. Visa programs require reapplication every one to three years and mandate that the spouses of those with working visas cannot be employed in the US. This poses barriers to obtaining a mortgage as well as insecurity over long-term employment in the US. By living on-site, several miles from town, dairy workers also face challenges to accessibility and interaction with the greater community. A changing demographic profile poses new challenges. Linguistic and cultural differences are often barriers to constructive communication between Anglos and Latinos. While there is more to be done, the Morris community has begun to address the needs of its changing demographics in constructive, inclusive ways. Beginning in 2009, Riverview started an English as a Second Language program headed by Robert Frischmon. Classes were taught onsite with the hopes of helping employees transition into work life. Simultaneously, Riverview started a Spanish language program for English-speaking employees to better facilitate communication at the dairy. In September of 2009, two university students, Yuri Machkasov and Abe Henry saw a growing need for ESL instruction as the numbers of incoming workers and families grew. To meet this growing need, they established an English as a Second Language program at the University in collaboration with the UMM Office of Community Engagement and Robert Frischmon, from Riverview. The program trained UMM students to lead and teach ESL courses. It was also the first major effort to bring Latino workers into the town of Morris and to facilitate interaction between groups. The UMM program has grown both in students and newly certified instructors due to a motivated student body, the Office of Community Engagement’s work led by Argie Magnolis, and the assistance of Windy Roberts, a member of the Spanish faculty. In 2011, three students, Katie Jacobson, Dani Brown, and Sarah Singsank, recognized that while ESL addressed language barriers, the nature of the program did not allow for sufficient cross-cultural communication and relationship-building. They created the Jane Addams Project, modeled after Jane Addams and the Hull House she founded in Chicago in 1889 and a program through Augsburg College with the same name. The project aims to reach beyond ESL and structured organizations to create a safe space for communication. Given the prevalence of Spanish speakers, the group is facilitated in English and Spanish, but other languages are shared when opportunities arise. The group meets weekly and holds bilingual conversation circles, potluck dinners, and holiday celebrations. The program also trains multiple interns each year in leadership and intercultural communication skills and hosts artists to show case the importance of sharing culture and language. These arts events, such as hosting spoken word artists and musicians, have drawn in more community members and displayed the potential that art has to create fruitful dialogue, story sharing, and relationship building. The University of Minnesota, Morris has also seen an increase in Latino students, and although as students their experiences differ from the Latinos coming to work in Morris and surrounding towns, they have taken on important roles in developing programs such as ESL and Jane Addams. By serving as interns and ESL teachers, they have provided necessary and valuable insights into multiculturalism and community building through cultural exchange. Independent of the University, the greater community has created several successful programs. 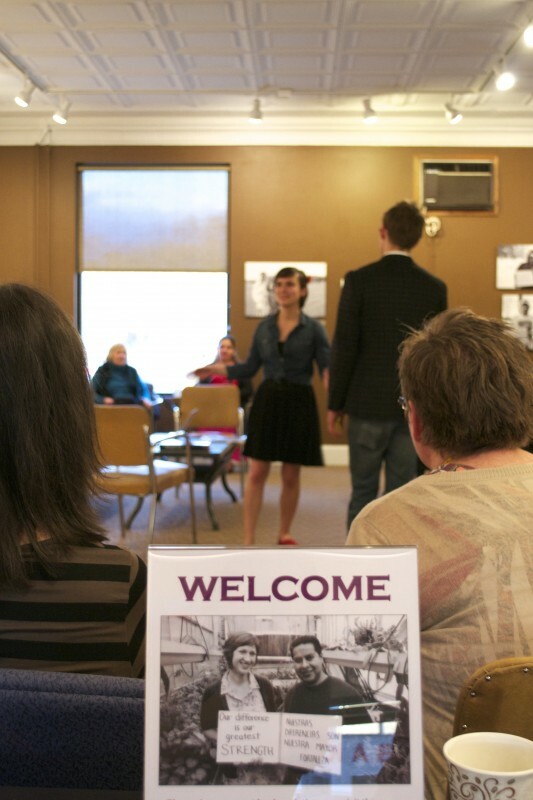 In 2011, community members collaborated to create the organization LAZOS–translated as ‘ties’ in English–the mission of which is to facilitate communication between Morris’ Anglo and Latino residents. According to its founders, LAZOS encourages members of the Latino community to constructively engage with Anglos, thereby forming strong ties. The organization holds an annual community meal each Spring which attracts hundreds of attendees. In addition, the group has helped to create a community soccer league and facilitated the ESL program held at the University. Latina women in the community have also created programs to address their own needs. Recently, with assistance from LAZOS, a group of women established a bilingual book club seeking to build friendship and support among women in the community of all ages and backgrounds. Angie Maria Lopez, a recently arrived psychologist, also created a Latina women’s support group this year. Despite being well educated with specialized degrees in areas like law, nursing, and veterinary sciences, many Latina women coming to Morris are unable to work due to visa and immigration regulations. This group serves as a safe space for Latina women to converge and organize around their needs. Finally, the local faith community has reached out to the Latino population. There are currently two churches, one Catholic and one non-denominational, which provide religious services in both Spanish and English. Left to right: Natalie Hoidal and Jordan Wente. Estar in el Prairie takes inspiration from these efforts. By bringing different groups in the community together to create art centered on the idea of “place,” we hope to actively celebrate and unite the community of Morris. The project acts on the idea that places are shaped through creativity and connectedness. To this end, the project pairs photographers from the established Anglo community with new Latino residents to discuss their personal experiences in the community. Given the pairing of cultures and languages, the title for the project is purposefully bilingual. Each pair decides upon a phrase reflective of the participant’s story, then the person is photographed holding a whiteboard of their phrase in both English and Spanish with the backdrop of a Stevens County scene important to each individual. For example: one Latino family wrote, “Raising our children in 2 cultures,” and was photographed together at the University, where the father teaches. In this way, the sharing of stories via the art of photography manifests the raw, yet beautiful, aspects of place, family, community, and culture, thereby conveying feelings and messages transcending cultural and language barriers. The process promotes the building of relationships that will help to promote and sustain future development and revitalization of the town. The project also calls surrounding communities to action. By shedding light on the positive experiences of Morris’ changing community and the lives of new immigrants, it asks other communities experiencing similar demographic changes to open their doors. Given the cultural and linguistic barriers that many new immigrants face, connection between established communities and new groups is often difficult. We hope that this project can begin to create relationships between photographers and participants that extend into the greater community. 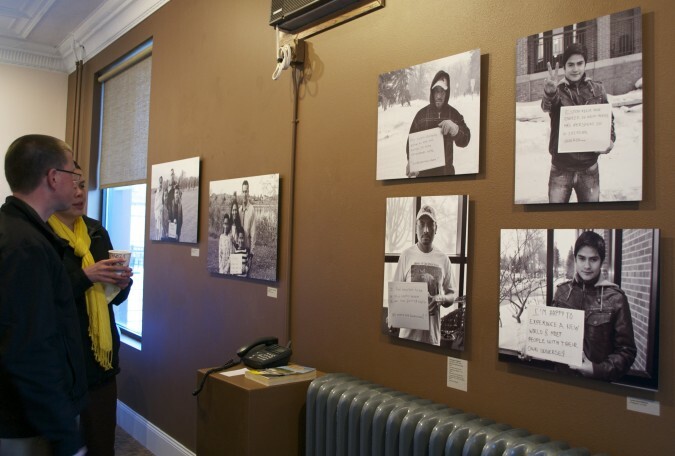 Synthesizing the efforts of many, we utilize art to expand and expose these projects and their missions in greater Minnesota. Morris is not the only community to experience “brain drain,” a changing economy, and a rapid influx of new cultures. 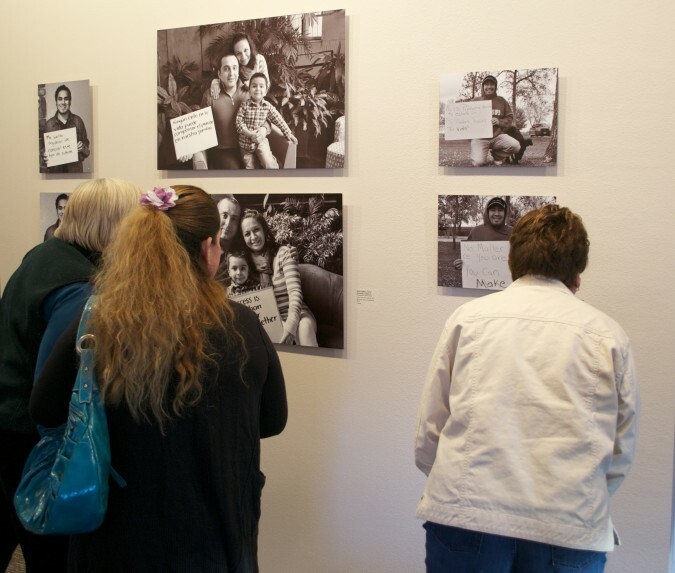 We believe that this art project and its simple photographs transcend town limits. Recognition of, and respect for, cultural diversity is pertinent to not only urban areas–as rural communities become proportionately more diversified, there will be greater need for intercultural communication and understanding. 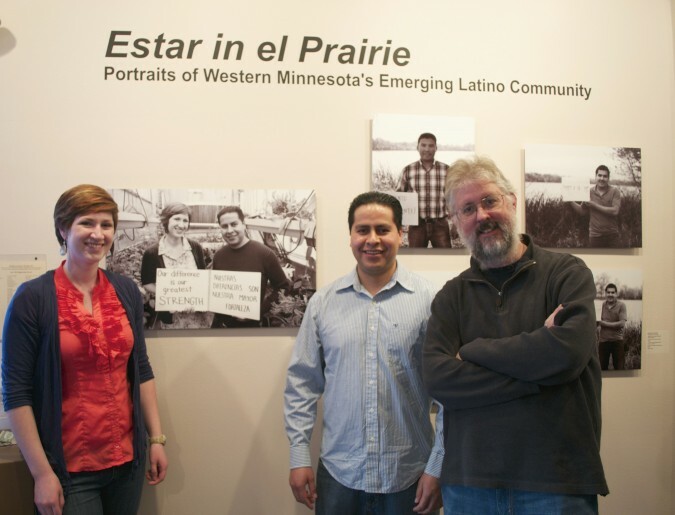 Estar in el Prairie ties these elements of community integration together; a photo is universal. Essay written by Natalie Hoidal and Jordan Wente, University of MN, Morris Students.